After graduating from Northwestern University, Linda Diamond, owner of Captured Clutter…organizing therapy, LLC, had the wonderful opportunity to work for several non-profit organizations in the metro Atlanta area. For twenty years, she had the best of both worlds, helping the world become a better place while organizing people and programs to accomplish the task at hand. After taking a ten year break to tend to her young children, she decided it was time to return to the working world. When Linda researched home-based businesses, she found her dream job in the Professional Organizing industry. Here was a field that would allow her to improve the quality of others’ lives with organizing strategies. Linda’s clients inspire her with their determination to use the tools she provides to help make their homes and businesses more efficient and less stressful. 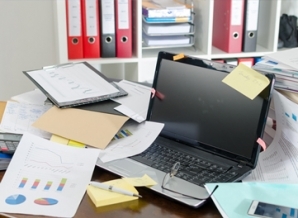 Captured Clutter…organizing therapy, LLC was formed to help overwhelmed people manage their excessive paper flow, out of control schedules and disfunctional space. Linda’s clients have taught her that no one has the same organizing issues and everyone has a different learning style. She works very carefully with clients to understand each individual’s personal needs, goals, and vision. Her clients learn to articulate what is causing their stress, how they envision a better tomorrow, and what steps they need to take in order to see results. NOT SURE HOW TO MANAGE YOUR CHAOS?